Christmas shopping can be a stressful experience. Good thing my favorite brand of contact lenses makes gift giving super easy this year because now, you can purchase the FreshLook Color Blends and Air Optix Gift Certificates at 25% off. It's the perfect gift for your four-eyed friends and family since they can claim whatever pair and eye grade they want! Back in my younger days, I used to beg my mom for blue contacts. Sadly, she said no. Fast forward a decade (or more) and colored contacts are still chic, I found myself living my teenage dream when I tried Air Optix Colors in Gray! Yay! 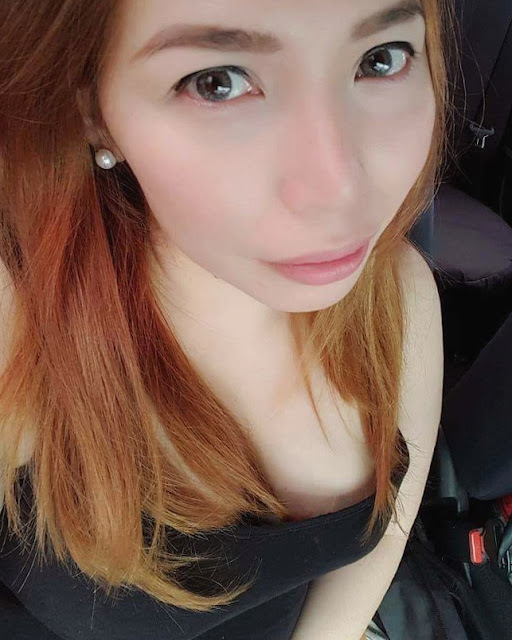 What I love about Air Optix Colors and FreshLook Color Contact Lenses is that they're very comfortable to wear and they look natural when worn. Also, I was amazed at the way they made my eyes pop. Yep, it's the best and easiest way to get that sultriest selfie-worthy peepers ever. See, younger self? Life's good and it really does get better. AIR OPTIX® COLORS and FreshLook®Color Contact Lenses are designed to enhance dark or light eyes and bring out one’s natural beauty. They are made with a unique, smooth surface and feature a technology that combines 3 colors -in -1 to blend naturally with the color of your eye. Filipino women can now choose to have AIR OPTIX®Colors for Long Hour Wear or FreshLook® for Everyday Wear depending on their lifestyle. These lenses are available with or without vision correction. AIR OPTIX®Colors and FreshLook®, both designed to create beautiful, natural looking eyes, while providing healthy vision and consistent comfort throughout one’s wearing period have their own special wearing modalities. Knowing how long you want to use your contact lens in a day matters. Just like our bodies need to breathe, oxygen is also essential for the health of the cornea, the clear, domed-shaped front part of the eye. Insufficient oxygen may cause corneal swelling and lead to irritated and red eyes which may bring about uncomfortable lens wear. AIR OPTIX® Colors is made up of proprietary “silicone hydrogel material which allows plenty of oxygen to pass through the contact lenses; therefore they are perfect for LONG-HOUR WEAR. FreshLook® on the other hand, used the classic hydrogel material and is best for EVERYDAY WEAR. This December, FreshLook ColorBlends and Air Optix Colors Gift Certificates will now be available in leading optical clinics at 25% discount. FreshLook® will now only be @ 896.00/pair instead of P1195.00 and AIR OPTIX® COLORS will now only be 1121.00/pair instead of P1495.00. GCs are available until December 31, 2016. Redemption is valid until January 31, 2017. 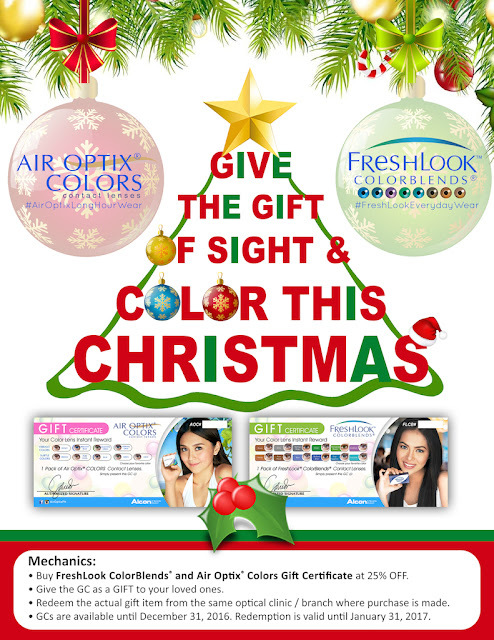 So, go and give your loved ones the gift of beauty and vision, give them AIR OPTIX®Colors and FreshLook Contact Lens. Have a fun, breathtaking, beautiful Christmas!